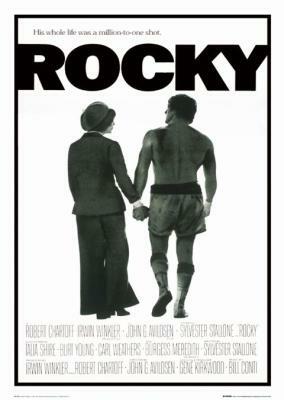 The main reason why I gave this movie 1 star is because the showdown between Rocky and Apollo Creed at the end is very disappointing. I was expecting a big climatic boxing match, but I was appalled at just how boring and short it was. Rocky didn’t even win the damn World Heavyweight Championship belt from Apollo Creed because the referee stopped the contest too soon. Right before the credits at the very end of the movie, Rocky looks so retarded screaming, “Adrian!” over and over again. What a lackluster conclusion. I’ve heard people tell me how the climax of this movie gave them goosebumps. Well guess what? I didn’t get one single goosebump! The ending to this movie sucked! Nearly everybody else seems to think that this movie is just the greatest thing they’ve ever seen, but I don’t. I bought this because of the fact that the DVD cover said ” Nominated for 10 acadamy awards!” This movie is aweful! 1 star is giving it too much credit. I love Sly Stallone but his acting was too painful to watch. I went to bed after suffering through the first hour. My wife informed me that it didn’t get any better. If this movie were to be released in this day and age, it wouldn’t have a chance! This has got to be the worst film I have ever seen in my life. I cant believe that there is more that one in the series. I absolutly hated it. I have never liked a film with Sylvester Stallone in it. Have you seen his mother, You cant tell them apart when there standing next to each other. I dislike all of the Rocky Movies. I’m sorry, but they are all mindless, and Sylvester Stalone is annoying, and can’t act. One star is giving this movie way too much credit. Stallones accent doesn’t help either. Strange enough the sequels were far better. The problem with this film is that it drags too much. I dont understand these posts…. I mean whether somebody likes something is all subjective…are these posts suppose to be funny? Personally, I *LOVE* the YCPE posts. Yes, opinions are subjective. Thankfully, some opinions are so ludicrous as to invite mockery and scorn. That’s what YCPE provides for me. For some reason every single one of these posts cracked me up. Maybe because Rocky is my husband’s favorite movie of all time, so these opinions are like night and day to his monologues extolling the movie’s infinite greatness. I especially like the people who are so turned off by it they just tune it out and don’t glean any of the message Stallone was trying to send. I didn’t like the first Rocky. I thought it was a very boring movie.